Amazon Fire HD 8 is an Android-based tablet designed to lure in buyers who don’t want to spend lots of money but still want a powerful device. It is among the latest lineup of new tablets from amazon. Amazon Fire HD 8 is a fun for the whole family, just like the Disney world. 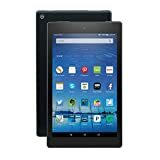 The Amazon Fire HD 8 has a metal frame coated in plastic. The 8-inch display is made with Gorilla Glass, which is designed to be more durable than the average screen. You will definitely be surprised by this tablet size and weight. It is really just about the thickness of a pencil. It is also very light, so it’s one of the skinny ones out there. The camera is at the top corner. On the other corner, there’s a microSD card slot which is expandable up to 128 gigabytes and everything is located at the top agent the power button, volume buttons, USB port, mic, and headphone jack. DOLBY speakers sound extremely pleasant. It has an IPS LCD screen with a slimline screen architecture. The screen is so impressive and the device has great viewing angles. Colours are nice and bright but it has the low resolution. In the new design, across the top are pronounced tabs for Recent, Home, Books, Video, Games, Shop, Apps, Music, Audiobooks and Newsstand. Each of those opens a section dedicated to that content, driven by the company’s recommendation engine, which draws heavily on Amazon Prime. Another exclusive benefit for a prime member is they can download thousands of prime movie videos and they can watch at anyplace without the wireless connection. Prime music gives access to over a million songs, music lovers here it is you can enjoy unlimited songs by a click. You can borrow any title from kindle. Amazon offers unlimited cloud storage for Prime members. Fire tablets can synchronize Kindle text with companion Audible audiobooks with real-time highlighting to create a more immersive reading experience, as well as deepen learning and comprehension. Amazon added Word Runner to help you read e-books faster. Amazon also lets Fire tablet owners share a family library, linking your account with your spouse’s so you can easily share apps. The Fire HD 8 comes preloaded with the Amazon Appstore, which defaults to the Amazon Underground version of the store. You’ll have access to 300,000 apps, and through the Underground, more than $10,000 worth of those normally paid items are free wow I can even download monument valley for free. Advanced parental controls encourage kids to read and keeps them away from potentially dangerous sites.Parents will be able to see not only how much time kids are reading, playing or watching videos on the Fire tablets, but also what books, videos and games the kids are using so children don’t waste time in playing games. Last but not least, the Blue Shade mode makes reading at night easier on the eyes, readers thing to be noted. Amazon also lets Fire tablet owners share a family library, linking your account with your spouse’s so you can easily share apps. The Fire HD 8 comes preloaded with the Amazon Appstore, which defaults to the Amazon Underground version of the store. You’ll have access to 300,000 apps, and through the Underground, more than $10,000 worth of those normally paid items are free. Wow! I can even download monument valley for free. Advanced parental controls encourage kids to read and keeps them away from potentially dangerous sites. Parents will be able to see not only how much time kids are reading, playing or watching videos on the Fire tablets, but also what books, videos and games the kids are using so children don’t waste time by playing games for extended periods. Last but not least, the Blue Shade mode makes reading at night easier on the eyes, readers thing to be noted.